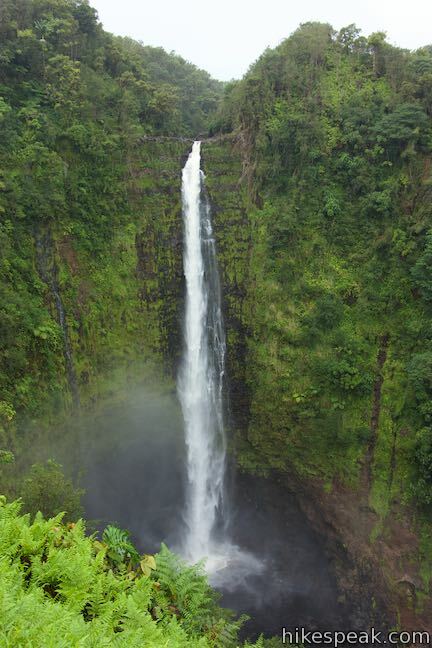 ‘Akaka Falls is stunner – considered one of the most beautiful waterfalls in Hawaii – with a 442-foot single-drop into a tropical valley. This great waterfall is paired with a great viewpoint. 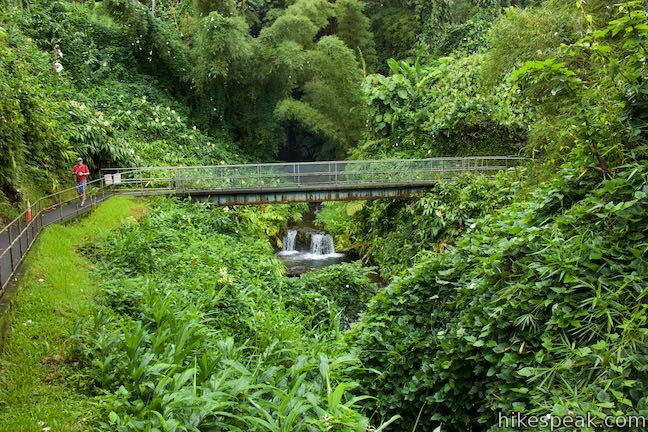 A paved 0.55-mile long loop trail leads to a lookout in front of ‘Akaka Falls, while also providing a glimpse of 300-foot tall Kahuna Falls and several small cascades. 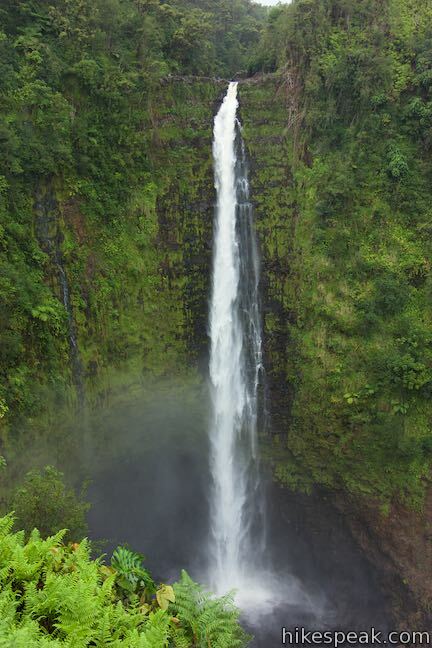 ‘Akaka Falls is the tallest waterfall on Kolekole Stream, which flows down the north side of Mauna Kea through the rainiest area of the Big Island. 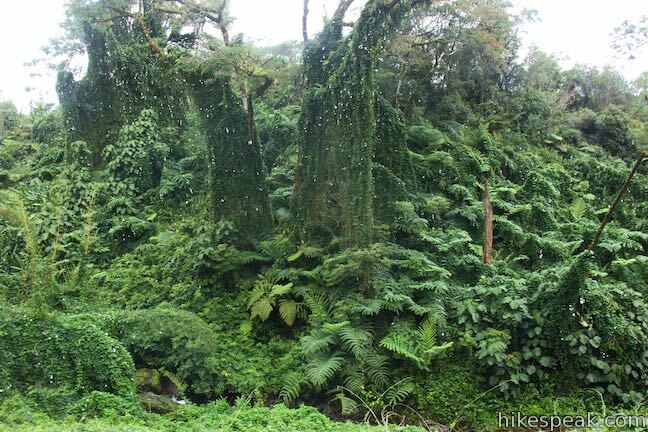 Expect the waterfalls to be gushing and the vegetation to be vibrant. 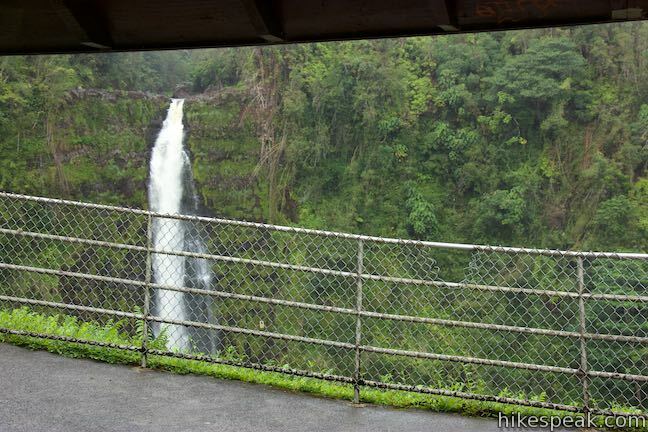 Start from a road’s end trailhead parking area in ‘Akaka Falls State Park, which has info panels and partial views of the waterfall. 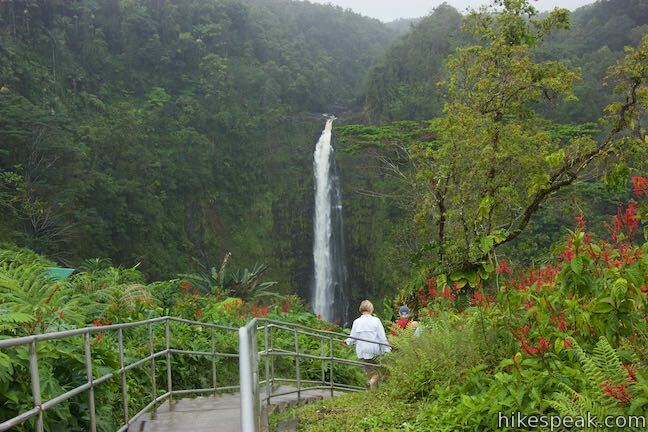 To really see ‘Akaka Falls, begin down the paved trail leaving the parking area. 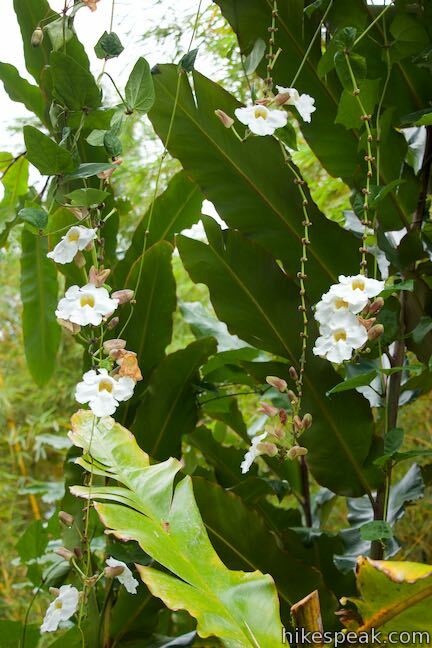 Cross a slope of tropical plants and comes to a T-junction after twenty-five yards. 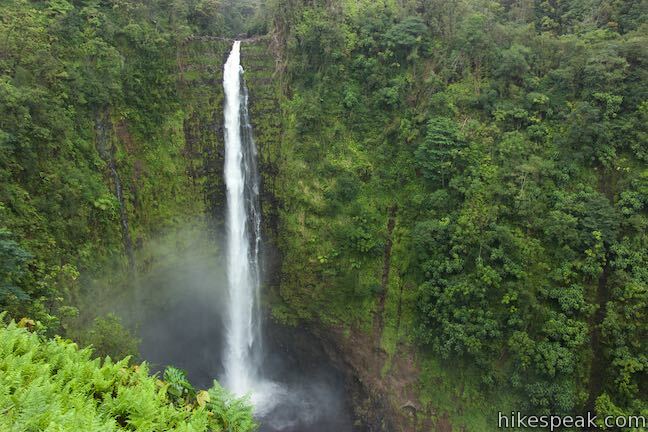 The shortest route to ‘Akaka Falls is to the left and you might visit the waterfall on a 1/3 of a mile out and back hike. 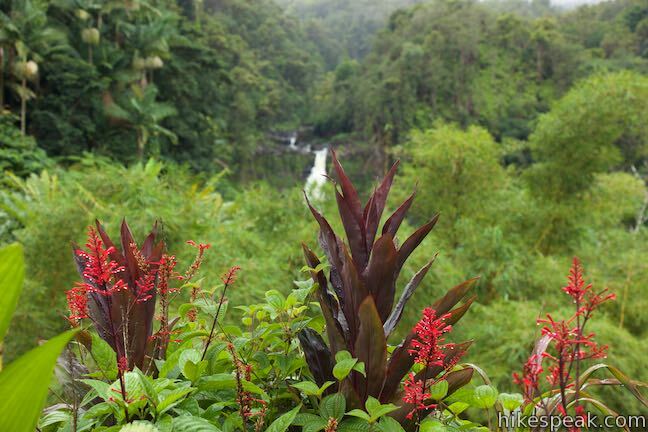 But why not hike the full loop and see more of the forest, take a look at Kahuna Falls, and collect additional views of ‘Akaka Falls? 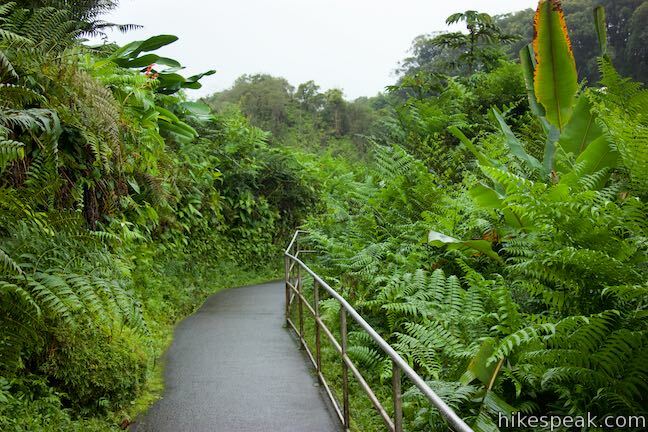 The loop trail is a little over half a mile long with 115 feet of elevation change. 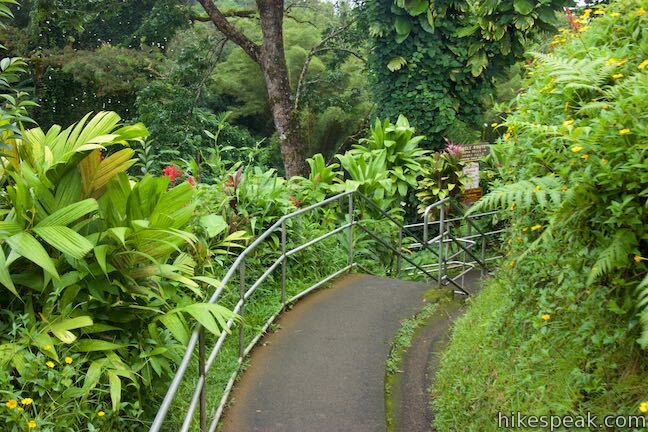 Turn right to follow the recommended direction for the ‘Akaka Falls Loop Trail (which is counter-clockwise). 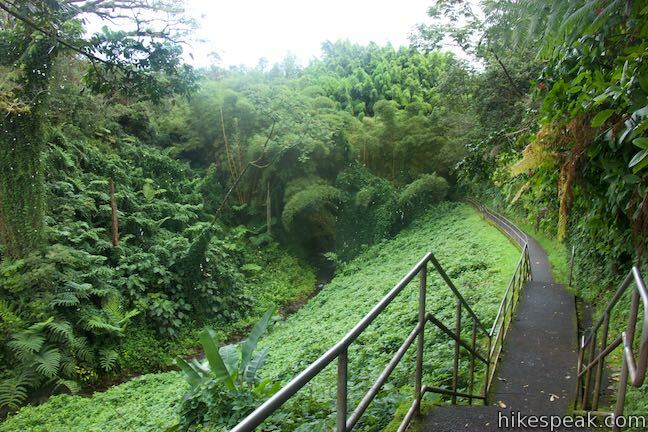 The trail descends along the side of a lush ravine. Several flights of steps are built into the paved trail. Watch your step. 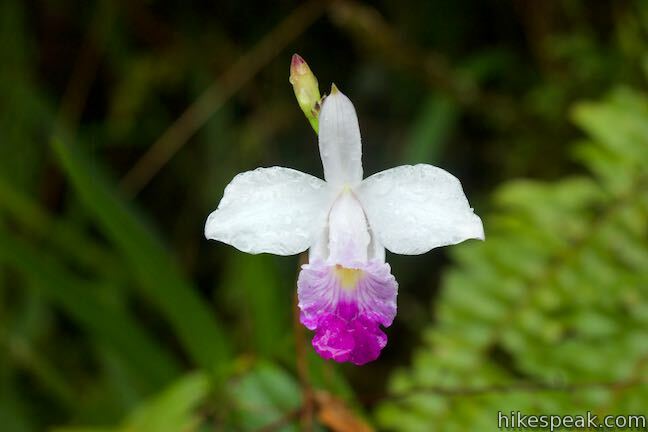 Rain falls frequently in this area, so the trail surface can get slippery. 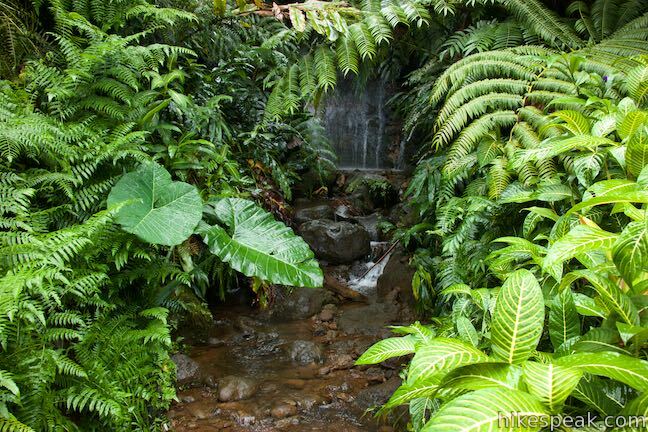 Ferns and impatiens cling to the side of the valley to your right, while a stream flows down the ravine to your left. 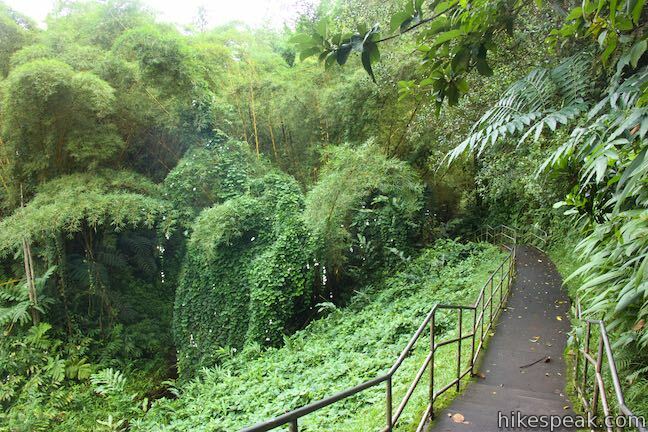 The trees all around the trail are covered in various epiphytes (plants that grow on other plants), so the surroundings are lush and jungle-like. 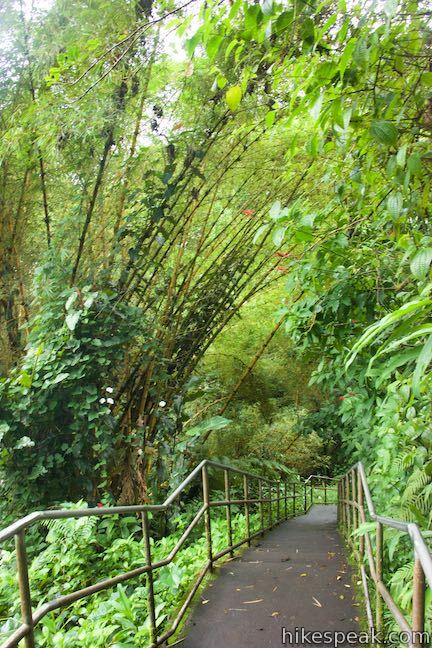 Descend to a footbridge over the small stream, which is flanked by tall stalks of bamboo. A sprawling tree above the left side of the gulch is particularly impressive. 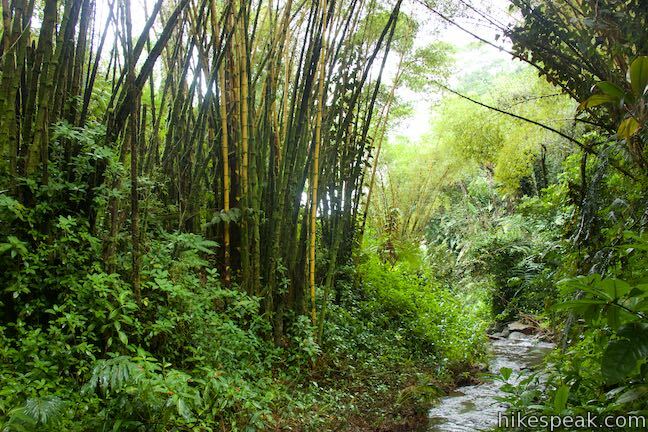 Leaving the stream, the trail passes through the bamboo to a junction. A sharp turn to the left leads to the rest of the loop. 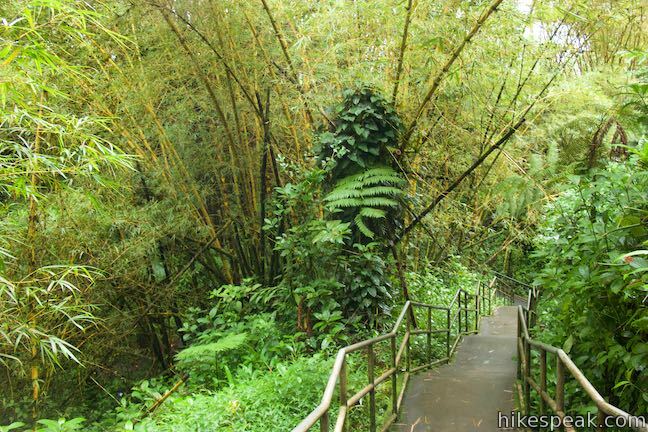 Straight ahead, it is just a few more steps to Kahuna Falls Lookout. 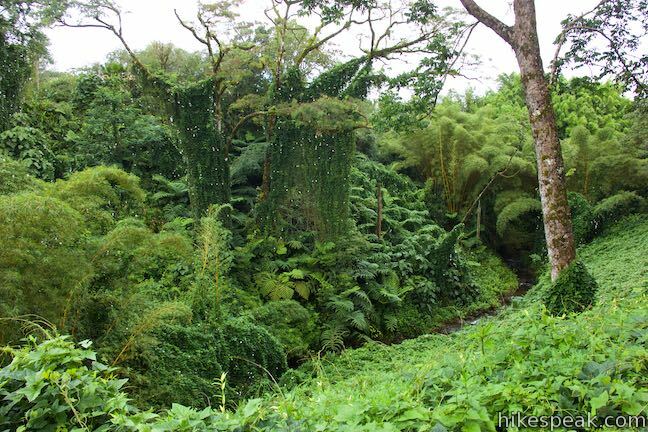 Peer out across the verdant valley carved by Kolekole Stream (downstream of ‘Akaka Falls). 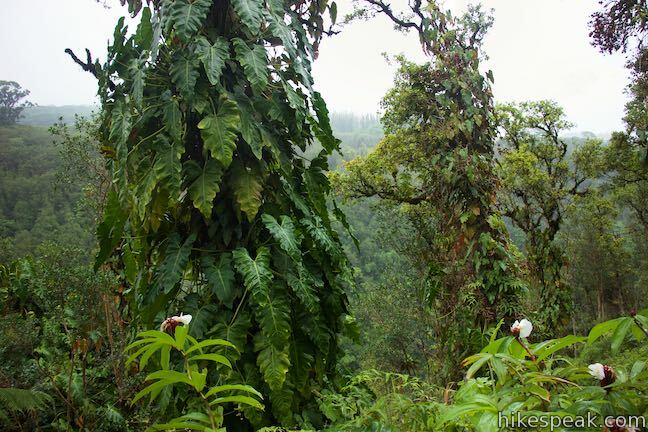 On the far side of the valley, look for a streak of white tumbling down the tree-covered slope. 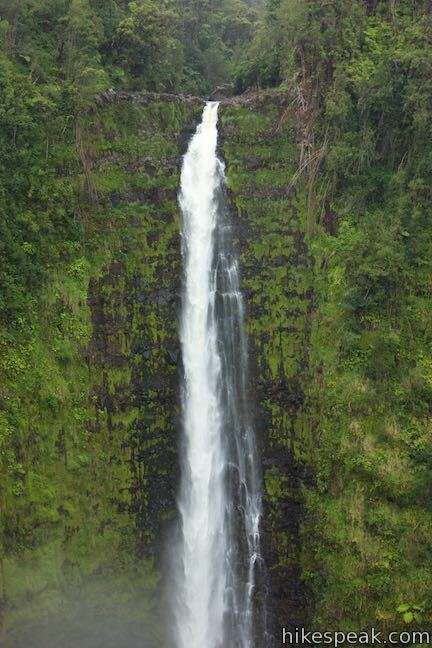 Kahuna Falls pours into the valley from a side stream. 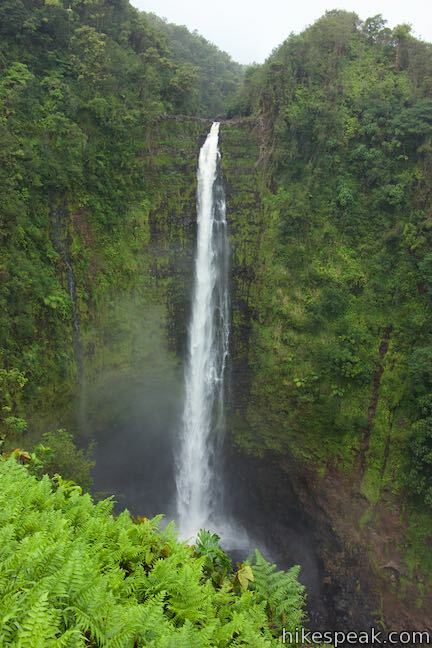 This 300-foot tall waterfall is obscured by trees, unlike ‘Akaka Falls, and harder to appreciate. Starting over 250,000 years ago, a spectacular volcanic eruption created Mauna Kea as many layers of lava flowed from the summit to the ocean. At the end of the eruption, a mantle of volcanic ash was laid on top of the basalt lava. Today, Mauna Kea is dormant and the summit is 13,796 feet above sea level. Rising over 30,000 feet from the ocean floor, it is the tallest mountain in the world. 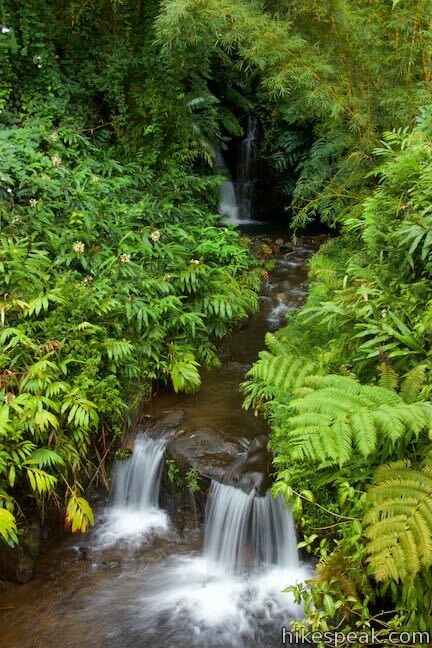 As the rain falls on the upper slopes of Mauna Kea, the water collects and runs down the slopes to the Hāmākua Coast. Streams have cut through the ash and basalt to create deep, narrow gulches. 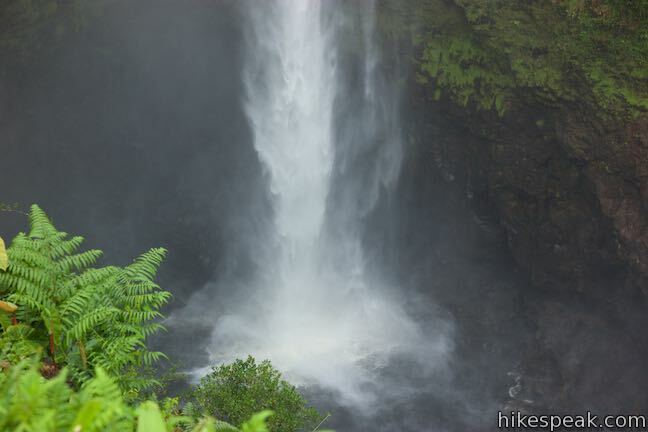 Waterfalls form when the denser basalt does not erode as easily and water must take a steep drop. 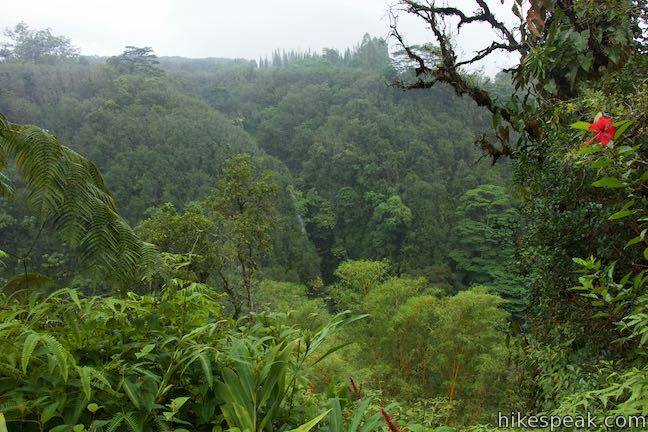 Leave Kahuna Falls Lookout, backtrack to the junction, and continue with the loop. 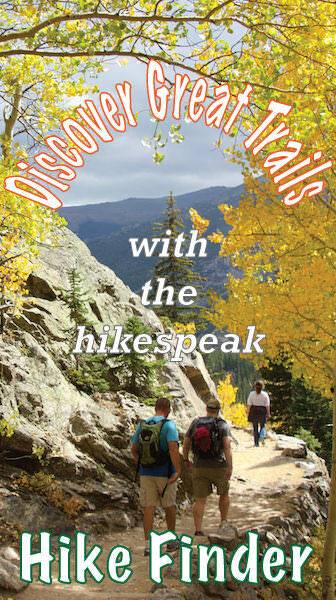 The paved trail climbs for a stretch, rising along a ridge between the main valley and the gulch you descended to start the loop. 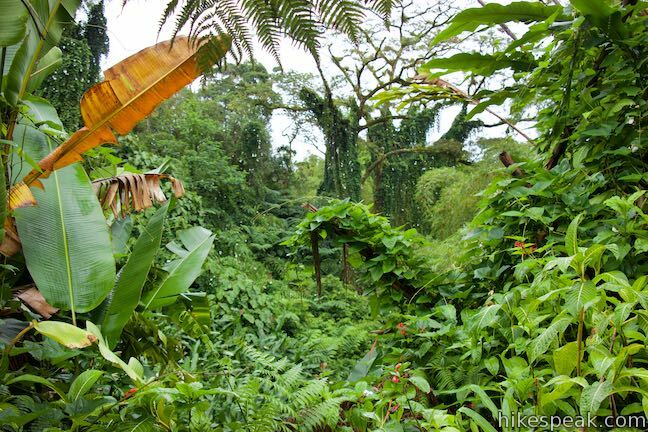 The vegetation remains abundant and impressive. 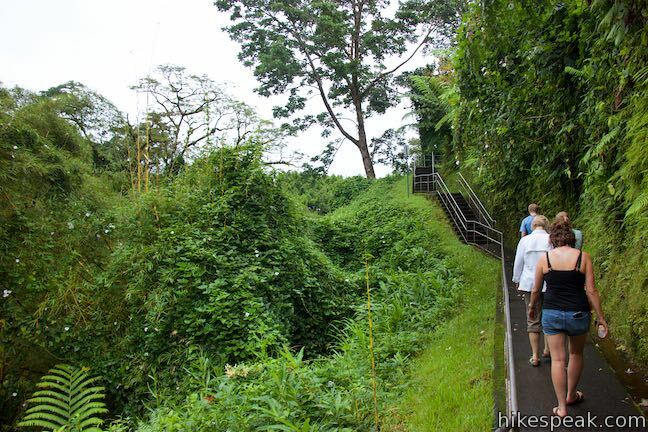 After a short ascent, the trail levels out and turns downhill. 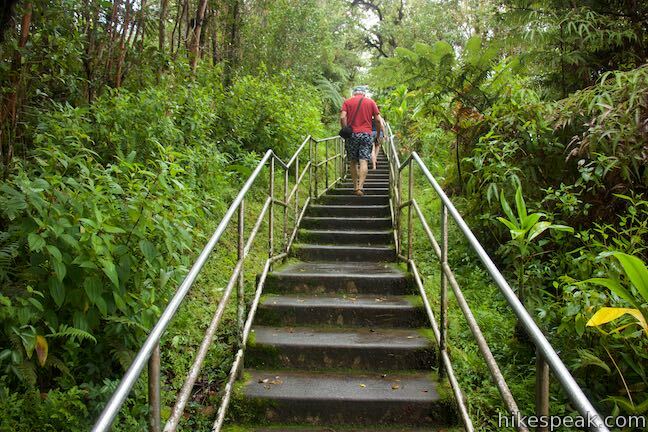 As you begin down more stairs, the growing perspective of ‘Akaka Falls will usher you forward. 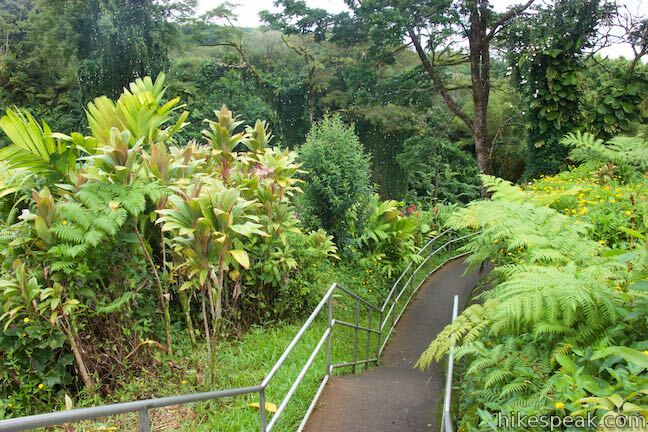 Descend to ‘Akaka Falls Lookout, which has a shelter – should you need to get out of the sun or rain. 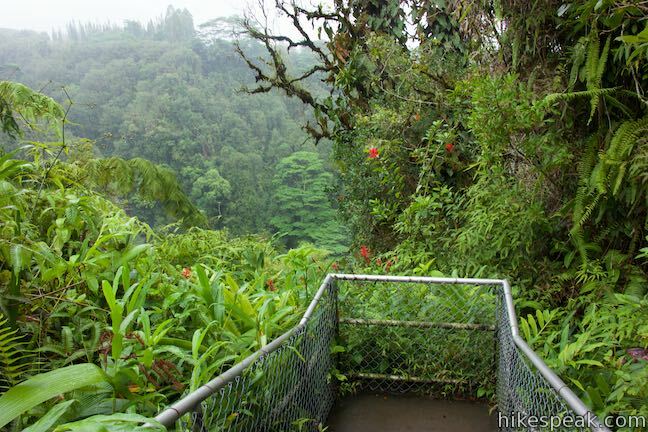 Step up to the railing and look out at ‘Akaka Falls (the cliffs in front of the overlook are quite steep, so definitely stay behind the barriers). 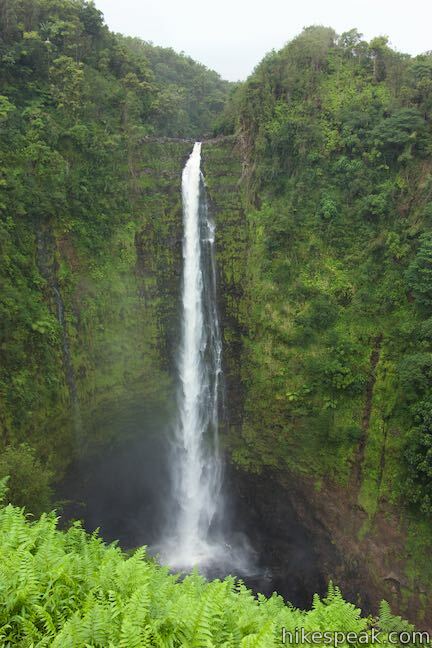 The 442-foot tall waterfall takes a single-drop plunge into the round pool below. 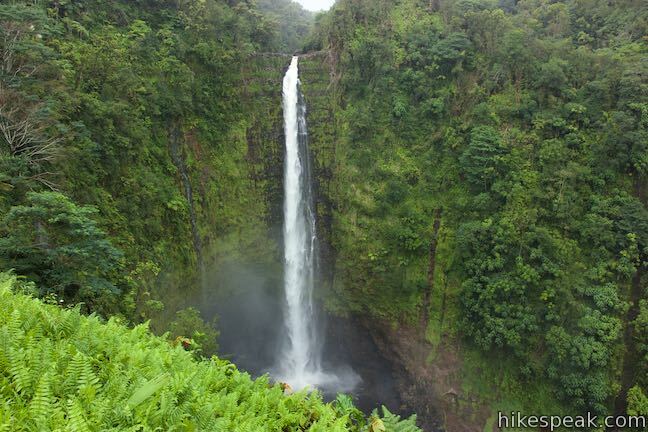 ‘Akaka Falls has a straight drop beside cliffs of dark volcanic rock that are draped in green moss and ferns. 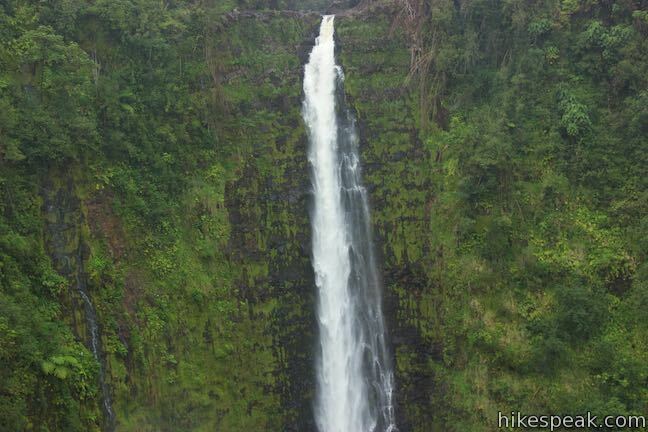 Kolekole Stream begins on the upper slopes of Mauna Kea and carries lots of water over ‘Akaka Falls.The 40-story waterfall is an impressive sight! 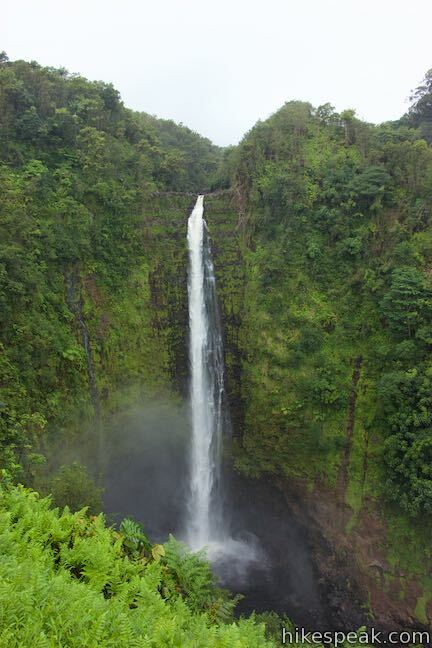 To the left of ‘Akaka Falls, you may spot a thin ribbon-like waterfall that pour down the cliffs during wet conditions, completing the sensational scene. 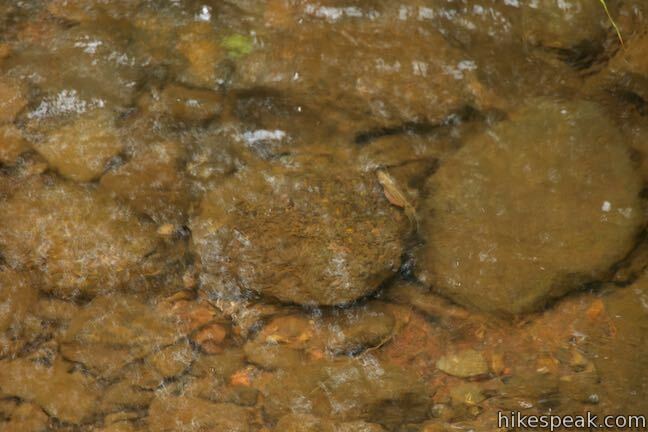 An ‘o‘opu begins as an egg laid in the upper reaches of the stream, often between rocks in the streambed. Once the egg hatches, the embryo drifts downstream with the current to the open ocean. The larvae remains in the ocean for up to 6 months. 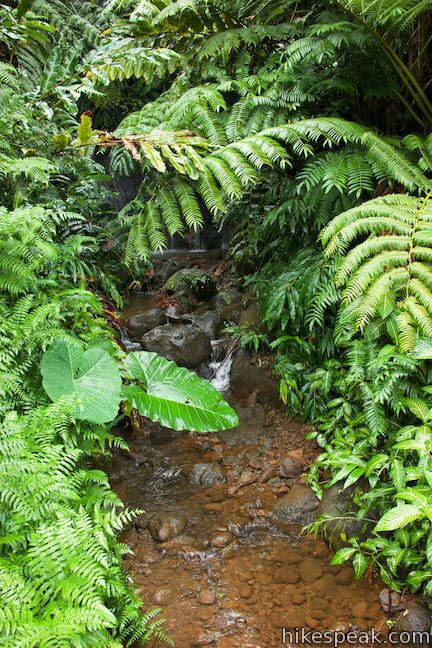 When the ‘o‘opu receives the freshwater signals from the stream, it is time to begin the swim back upstream. 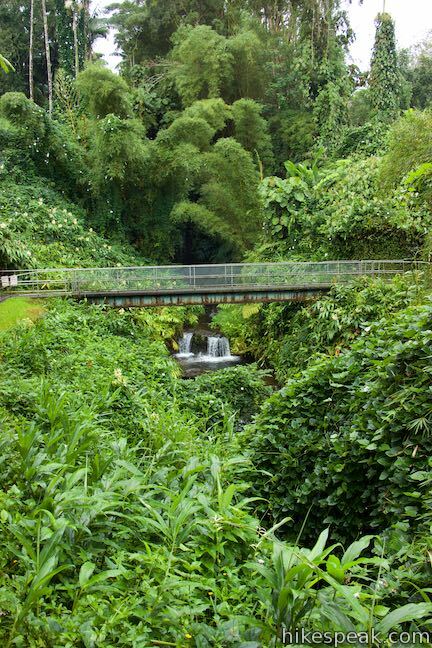 The ‘o‘opu ‘alamo‘o swim two and a half miles up Kolekole Stream and then the five-inch long fish climb over four hundred feet up the slick cliffs against the flow of ‘Akaka Falls to reach the stream above where they can live out adulthood. What a journey! 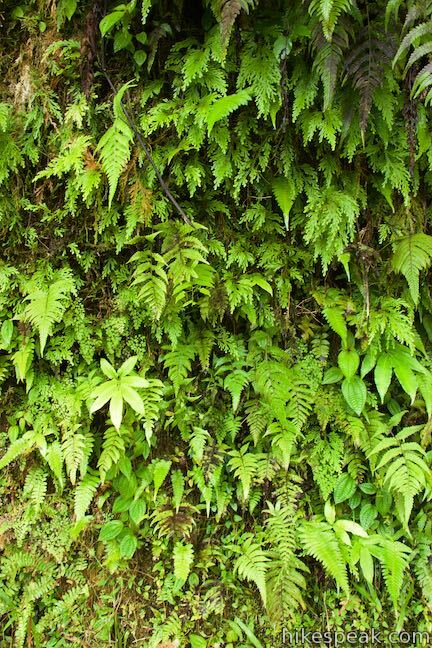 The name ‘o‘opu ‘alamo‘o comes from the Hilo area and refers to the lizard-like (mo‘o) shape of the head. The scientific name for ‘o‘opu ‘alamo‘o is Lentipes concolor. This name recognizes the ability of the male to change colors during courtshop and periods of aggression. Female ‘o‘opu are tan or olive in color, while males can turn black and orange when they need to impress. 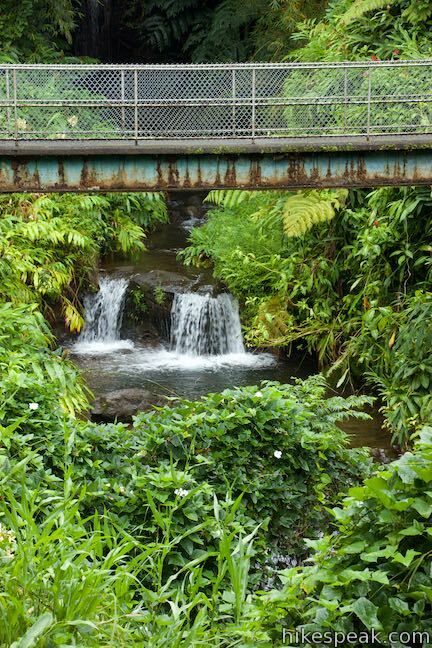 In addition to this fish, a shrimp called the ‘ōpaekala‘ole is also able to climb the waterfall. These amphidromous shrimp are also born in Kolekole Stream and swept away to the ocean to grow as larvae before returning to the stream. 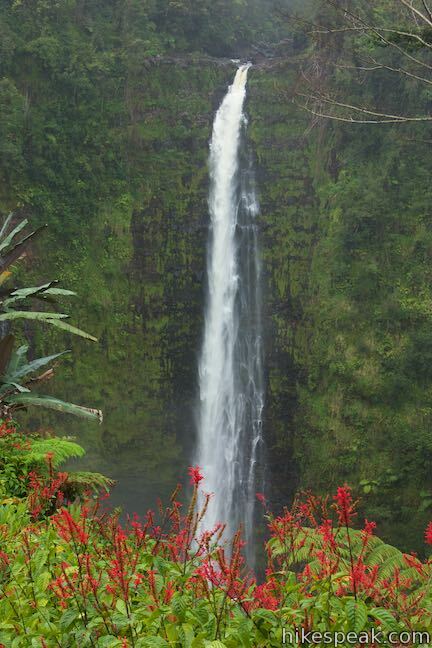 Spend ample time admiring ‘Akaka Falls. Then leave the lookout shelter and continue with the loop trail. 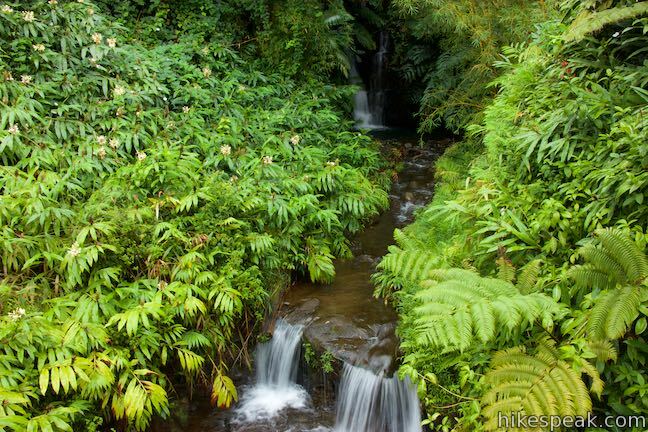 If stepping away from the beautiful waterfall gets you down, fret not; the trail does its best to keep your spirits high by passing several smaller cascades. 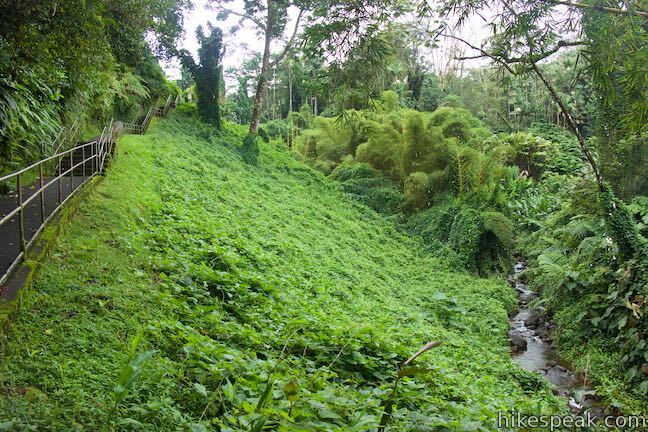 Study these streams and you may spot an ‘o‘opu fish ascending one of the branches off Kolekole Stream (apparently trying to avoid the big waterfalls). 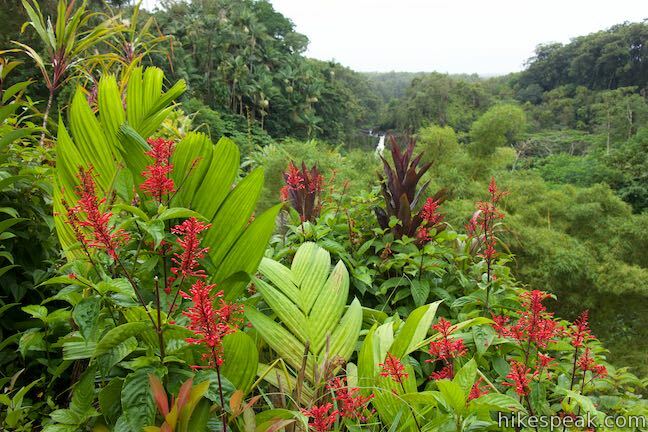 The tropical vegetation along the trail is lush and flowering. 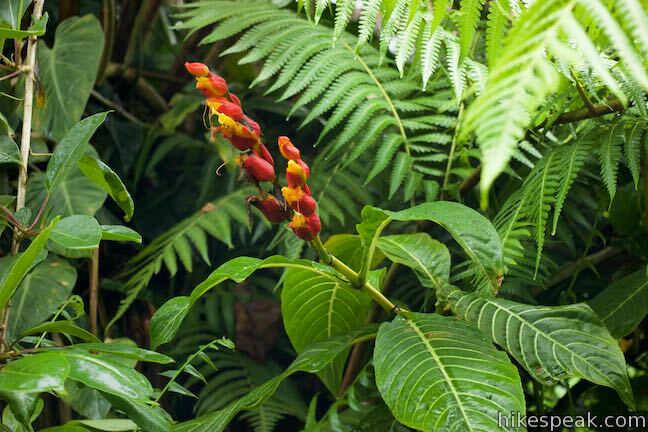 The green leaves of philodendron are accented by impressive red blooms of lobster claw heliconia. 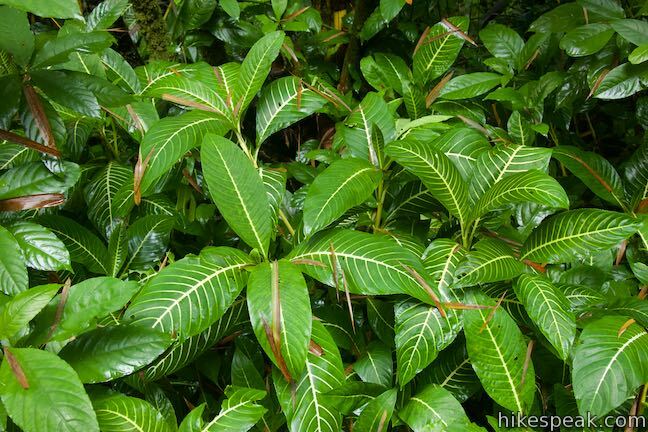 The red-tipped leaves of ti plants thrive along the trail too. 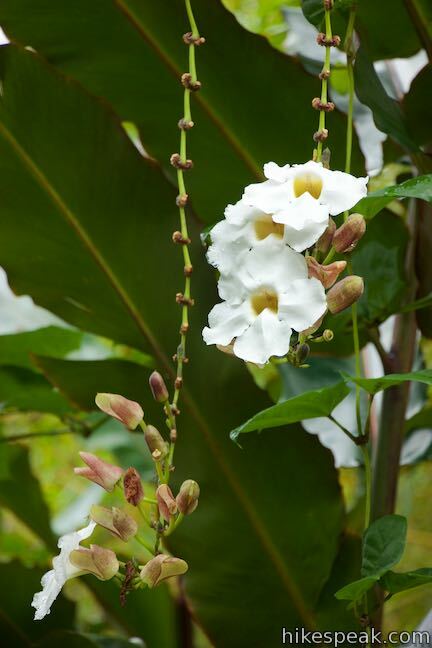 Admire the diverse plant life, which is almost completely non-native. 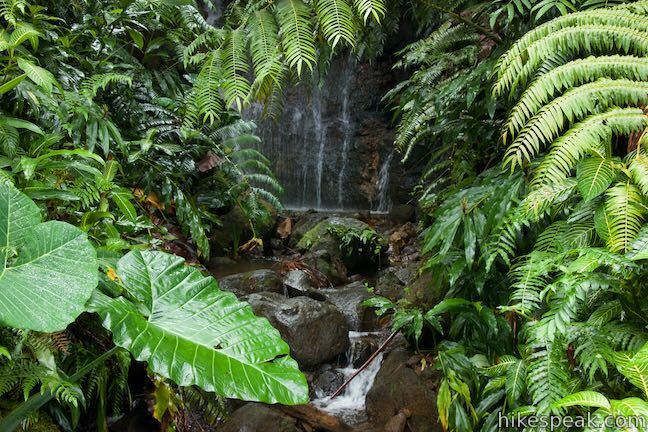 As the din of the waterfall fades away, listen for singing birds. 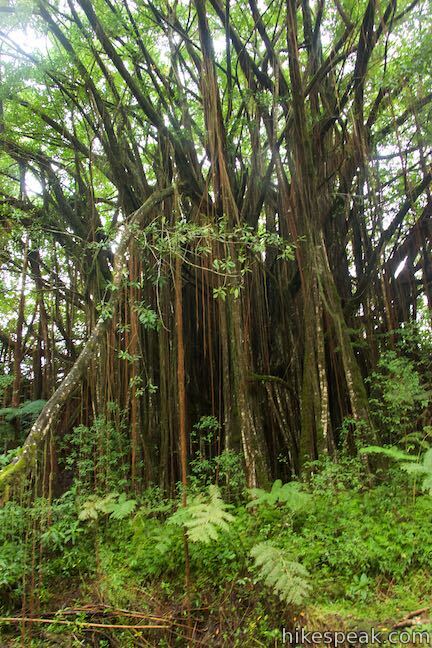 This area of the Big Island is home to several uniquely adapted Hawaiian birds like ‘i‘wi, ‘amakihi, ‘apapane, and ‘elepaio. 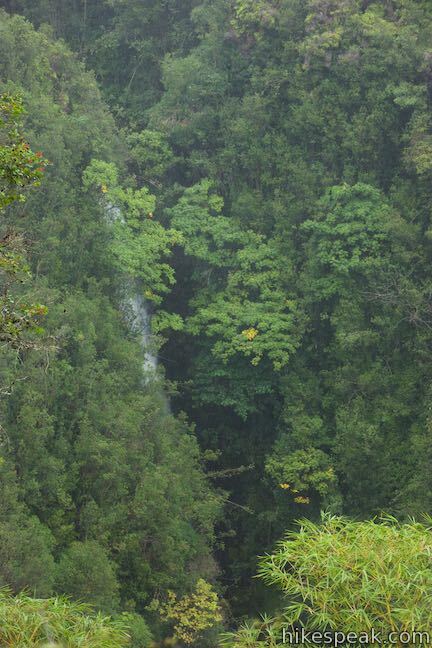 Cross a second creek, a tenth of a mile from ‘Akaka Falls and half a mile from the start. 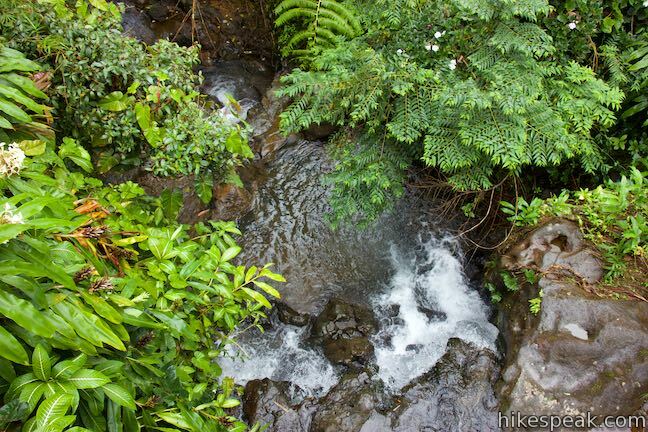 Admire cascades that are both upstream and downstream from the bridge. 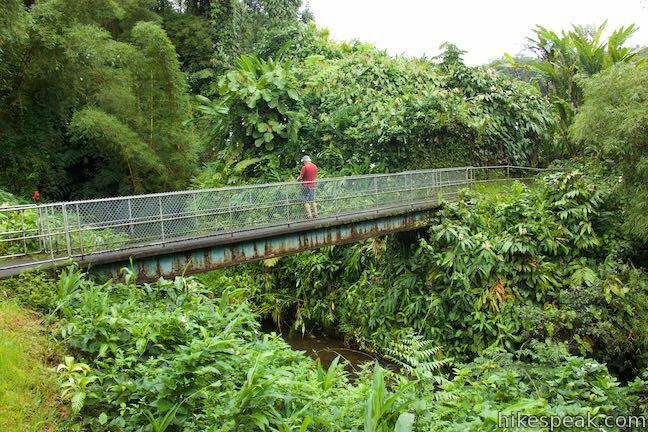 Across the bridge, the trail turns left and rises along a fern-covered slope. To your left is a new perspective down the gulch that you explored on the way to Kahuna Falls Lookout. Make your way up to the junction where the loop began. Bear right and walk back to the parking area. 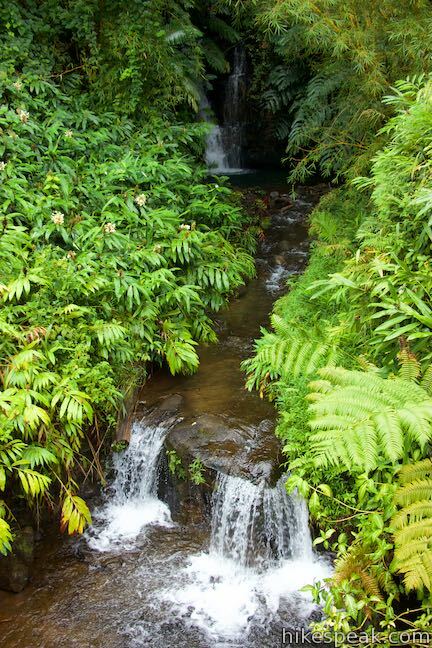 To see another nearby waterfall, check out Rainbow Falls in Hilo. 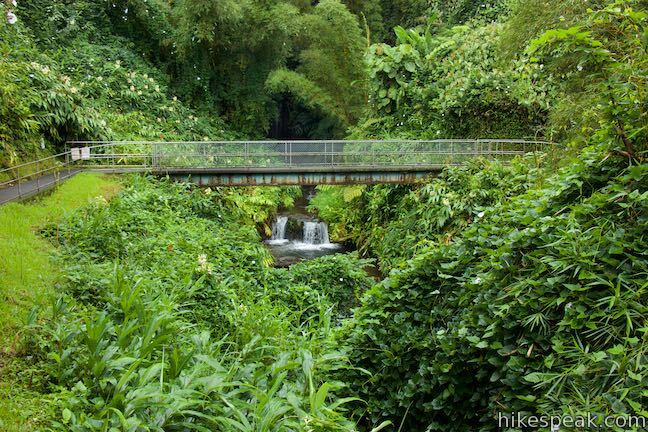 Although no hiking permit is needed for this short loop, ‘Akaka Falls State Park does charge an entrance fee, which is $5 per vehicle or $1 per person for those who arrive by bike or on foot. 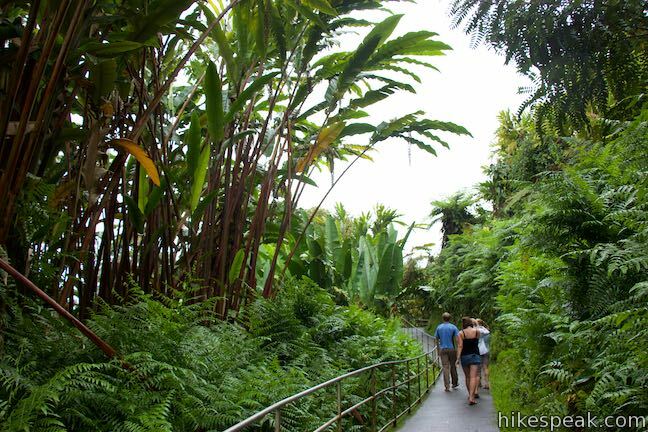 Hawaii residents may visit the park without charge. The fee can be paid an electronic kiosk or with the assistants of a park attendant. Bathrooms are located at the trailhead. Bikes and dogs are not allowed on this hike. 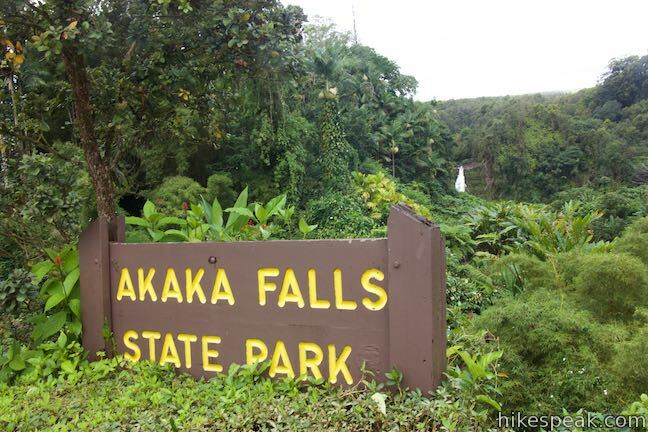 The parking area in ‘Akaka Falls State Park is open from 8:30 a.m. to 6 p.m.
To get to the trailhead: From Hilo, Taka Hawaii 19 (Hawaii Belt Road) north for 11 miles. 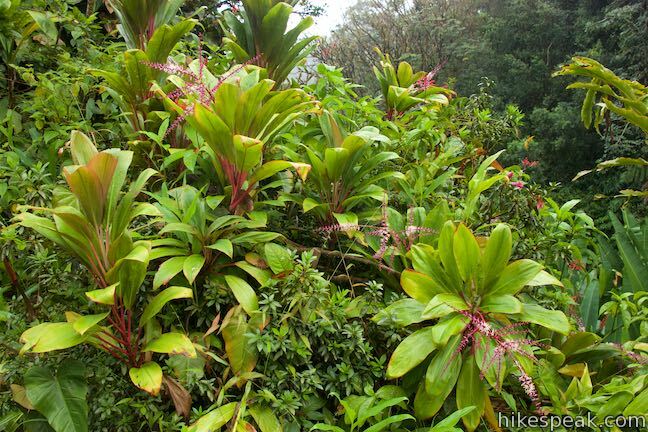 Following signs for Akaka Falls, turn left up Honomu Road (on the mauka side of the road). 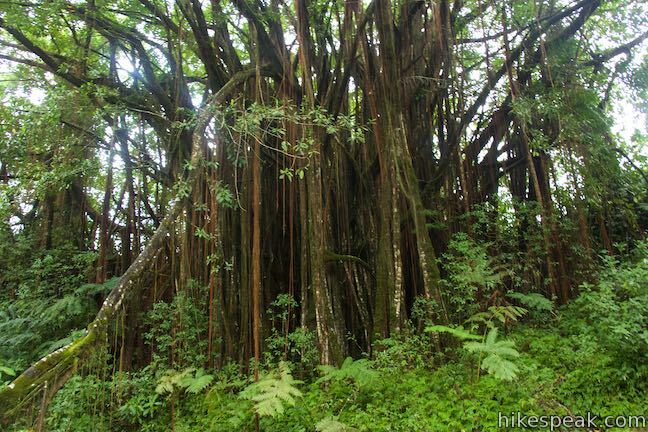 Drive 0.4 miles up to the town of Honomu. 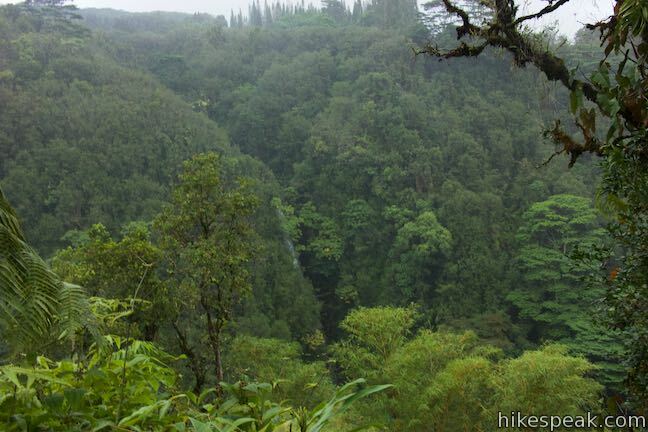 Turn left and then make the second right onto State Highway 220 (Akaka Falls Road). Drive another 3.3 miles to the trailhead parking area at road‘s end. 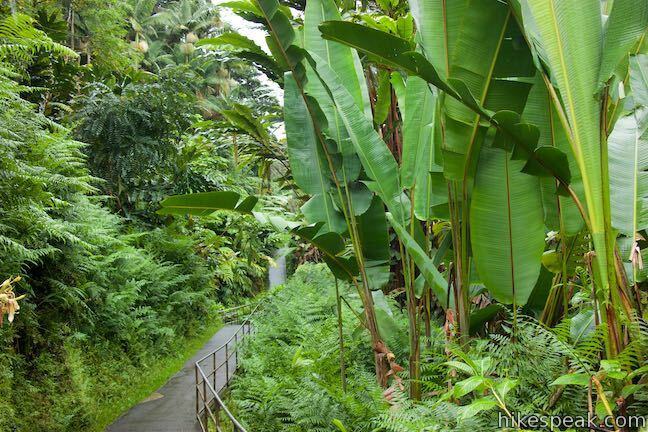 Coming from Waimea, travel 43.5 miles east on Hawaii 19 (Hawaii Belt Road) to the intersection with Honomu Road that leads up to Akaka Falls Road.